The Department of Parks and Wildlife Management in conjunction with other stakeholder institutions on Wednesday 16 September, 2015 converged at the Baobab Holiday Resort in Bijilo to review and validate the 2nd generation of the National Biodiversity Strategy and Action Plan (NBSAP). The validation workshop also coincided with the launching of the Clearing House Mechanism (CHM) Web Portal, an ICT tool that has the potential to provide fast information on the state of affairs of the country’s biodiversity. The occasion brought together participants from the Biodiversity Action Journalists (BAJ Gambia), National Research Institute, Forestry Department, University of the Gambia, National Assembly, Gambia Beekeepers Association, and UNDP among a host of other institutions. Delivering his keynote address on the occasion, the Permanent Secretary at the Ministry of Environment, Ousman Sowe described the programme as the first of its kind in the history of biodiversity in this country. In 1992, he said, the Gambia government signed the biodiversity convention becoming the 63rd country to the party. He noted that the action plan is a national document which needs to be judiciously adopted and validated. For the CHM, P.S. Sowe explained that after its launching, all stakeholders will be able to access the website as it is a portal for all species. The programme also featured the presentation on NBSAP 2015-2020 which entails 20 headline targets under 5 specific goals for the Gambia to attain. “Biodiversity is one of the biggest entities in the world,” says Salmina Jobe, while presenting on the NBSAP processes and the importance of CHM. 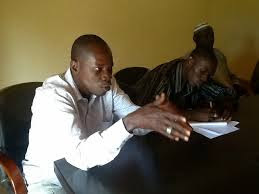 Other presenters include Mr Kawsu Jammeh of the Department of Parks and Wildlife Management (DPWM) and Ousainou Touray, the NBSAP Interim project manager. The DPWM manager, Momodou L Kassama chaired the occasion.